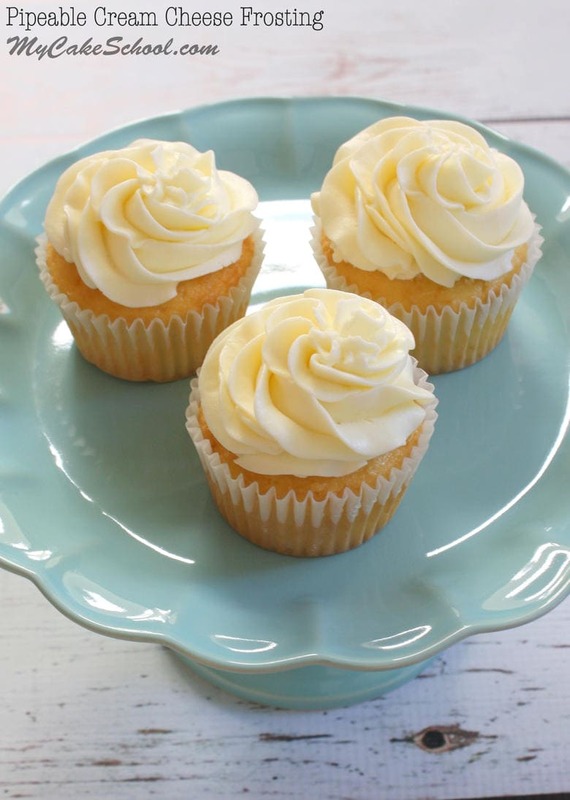 You are going to love this amazing Pipeable Cream Cheese Frosting recipe! I love any dessert that involves cream cheese, and I especially love cakes and cupcakes that are filled and swirled with a generous dose cream cheese frosting! We have another delicious recipe for Cream Cheese frosting that we have used for years, and can still be found on our site, but this new version of ours pipes even better, has a creamier consistency, and holds it’s shape perfectly. You’ll find that this Pipeable Cream Cheese Frosting recipe delivers all of the cream cheese deliciousness that you are looking for without being overly sweet. We hope that you enjoy it as much as we do (be warned: it’s highly addictive)! What Cakes Pair Well with Cream Cheese Frosting? Carrot Cake– This scratch carrot cake recipe is out of this world! Italian Cream Cake-This southern classic wouldn’t be the same without cream cheese frosting! Classic Chocolate Cake– Ahhhh… this decadent chocolate cake with cream cheese frosting is heaven! Is Cream Cheese Frosting softer than regular frosting? Yes. As with most cream cheese frostings, the consistency of this frosting is a little on the softer side. If you need a thicker consistency, you can add additional powdered sugar in small amounts until you reach the desired consistency. However, this cream cheese frosting is thicker than most, thanks to the amount of cream cheese in the recipe. What Should I do if my Cream Cheese Frosting becomes too soft to work with? If your Cream Cheese Buttercream becomes increasingly soft as you pipe, to the point that it no longer holds it’s shape, just pop it in the refrigerator for a minute. Some decorators even prefer to prepare two piping bags and alternate between them. Does Cream Cheese Frosting need to be refrigerated? Yes. Cream cheese frosting, and cakes frosted with cream cheese frosting should be refrigerated. However, it does become firm when chilled. You will want to remove from the refrigerator for 1-2 hours before serving (or using) so that it has time to soften. 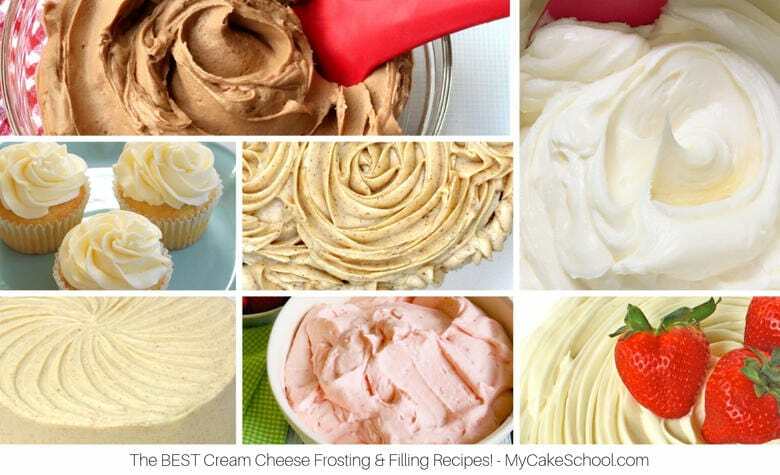 don’t miss our roundup of the best cream cheese frosting recipes! Thanks for stopping by! Enjoy the recipe! This easy and delicious Pipeable Cream Cheese Frosting is the BEST! Wonderful cream cheese flavor and perfect for piping! Add the pieces of softened cream cheese to the mixing bowl. The cream cheese should be soft enough that it combines easily into the butter/powdered sugar mixture. Beat on low/medium speed about 1 minute or until the cream cheese is blended in. Add the powdered sugar and vanilla. Beat on Medium speed for 2 to 3 minutes (a bit longer if using a hand mixer). Scrape the bowl mid way through. Do not over beat. Use immediately or refrigerate. If beaten too long it my become too soft. If this happens, just refrigerate a short time and let it firm up. We hope that you enjoy this recipe! Don’t miss our full collection of favorite cake and frosting recipes in our Recipes section! Hi Nilda, Yes, you should be able to pipe with no problem. As you know, the completed cake will need to be refrigerated because of the cream cheese. Let the cake warm up a hour or so before serving. Would you say this recipe could also be considered a crusting recipe? Hi Nannette, It will not crust as a buttercream recipe does. It firms up nicely when refrigerated and can be smoothed with the hot knife method. Hi Lesley, We do not recommend using cream cheese frosting under fondant. Cream cheese always needs to be refrigerated. As an option you could use a cream cheese filling and frost the cake with buttercream or ganache, then lay on the fondant. If you use a cream cheese filling, take the cake out of the refrigerator about 2 hours before serving so the cake can warm up a bit. This recipe uses more cream cheese but less sugar than your original cream cheese frosting. Can I still frost a two tiered cake with this? Hi Crystal, This recipe makes 6 cups of frosting. To frost a 2 layer 8 or 9 inch cake you will need 4 1/2 to 5 cups. If you plan to do a lot of decorative piping, (more than just a border at the top and bottom) you may need to increase the recipe by 1/2. I just got my cakes out of the oven and they have sunk abt an inch in the middle. Not sure what the problem is. Over mixing? Hi Cindy, I am sorry about that. The most common cause for sinking in the center is because they were under baked. Did you check by inserting a toothpick in the center of the cake? The toothpick should come out clean or with just a few crumbs attached. Also, you should buy an oven thermometer to see if your oven is reaching the temperature that you have set it to. Actually they were sunken in while still in the oven. I reread the recipe and I realized that I had omitted the flour. I am thinking that was the problem. Hi Cindy, Yes, that would be the cause. Don’t worry, leaving out an ingredient happens to everyone now and then. Hi BeBe: I am making a white cake and cheese cake layer cake for Easter and am looking for a raspberry cream cheese frosting. Would this hold up if I use a raspberry purée in it and how much would you suggest. Hi Pat, This recipe has all the liquid it needs with the butter and cream cheese. Adding additional raspberry puree or jam would make it too soft. You could use 1 teaspoon raspberry extract and 1 teaspoon vanilla instead of the 2 tsp. vanilla written in the recipe. You could make a raspberry puree with fresh or frozen raspberries or a quicker method is to use 1/2 cup seedless raspberry jam, 1/2 teaspoon extract and a bit of red gel food color to get the right color. Spread this between the layers for raspberry flavor.